Comments: Comments Off on Manziel battling the playbook is not a good thing. Manziel battling the playbook is not a good thing. Browns head coach Mike Pettine made the comment yesterday that Johnny Manziel biggest challenge is the playbook rather than Brian Hoyer. ESPN and most of the national media took that to mean that as soon as Manziel gets the playbook down, he will be the starter. Not so fast my friend. What Pettine means is that Manziel is struggling to learn and understand the playbook. That is not a surprise. At Texas A&M the playbook was the size of the US Constitution. To Manziel the Browns playbook looks more like the IRS rules and regulations. We were told that he was studying even while going to and from Vegas. Maybe the inflatable swan had an I-pad built in. His time enjoying himself could be costing him now. You can’t win the locker room as a QB unless you know the playbook COLD and can communicate it in practice. Until he can do that he will not get a snap in the regular season. Also in college Manziel never had to make pre-snap reads. His offensive teammates took their position on the field then read the signs on the sideline to determine which play would be executed. 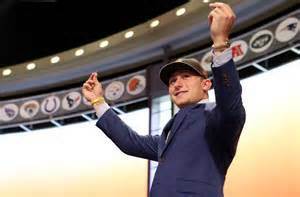 Manziel also never had to worry about blocking adjustments but he will be expected to know and implement them now. In the NFL, a GM or coach that listens to what the fans want will be sitting with them soon. Manziel hurt his standing in the locker room with his off the field partying. Once a QB loses the locker room it is very hard to get it back. Hoyer seems to have a better understanding of the playbook and the support of most of the team. The bottom line: Don’t expect Johnny to be the starting Browns QB any time soon. Comments: Comments Off on What to look for in this weekends games. What to look for in this weekends games. We would like to thank the Rays, Twins and Reds for stopping by in the playoffs. Please pick up your parting gifts as you leave. The series will be between the Yankees and the Phillies. #2 Ohio State v. Indiana – Forget about the injuries on O, you and I could score the Indiana D if you were having a bad game. The OSU D stops a good Indy O and OSU wins. #3 Oregon @ Washington St. – Oregon runs up 50+ points and makes a case for jumping over OSU into 2nd. #8 Auburn @ Kentucky – Auburn QB Cam Newton passes a bad Ky D silly. Auburn wins big. #9 Arizona vs. Oregon St. – Az had a major letdown after a big win over Iowa and squeaked by Cal. They had better not have a let down here because the Beavers are tough. They have lost 2 games to top 6 teams. #11 Arkansas @ Texas A&M – Ark is banged up after getting thumped by #1 Bama. The week off should help. TAM lost a tough game last week against Oklahoma St. Arkansas should win but this could be close. #12 LSU @ #14 Florida – This should be the game of the week. Both teams have serious flaws but play hard. LSU has to keep the turnovers down. I think Florida wins close in a minor upset. #23 Florida St. @ #13 Miami – FSU looked bad against the only tough team they have played Oklahoma. Miami played close against #2 Ohio St and got a nice win last week against a good Clemson team. Miami wins. Ravens -7 vs. Broncos – The Ravens are for real but could have a let down (and some injuries) from the win last week over Pit. Ravens should win and cover the spread. Bucks @ Bengals -7 – The Bengals are better than they looked against the Browns last week. They win and cover with the running game leading the way. Browns @ Falcons -3 – The Browns winning streak ends at 1. Falcons cover easily. BEST BET – Saints -6 @ Cards – A change of QBs by the Cards won’t help. Saints cover easily. BIG GAME OF THE WEEK – Vikings @ Jets -4 This is a must win for both. The Vikes are the better team but are not playing like it. The game will boil down to the play of the of the QBs. Farve will be pressured and is not having the season he did last year. The addition of WR Moss will help next week but not that much this week. The Jets had better cover Moss on the fly pattern or they will get burned. The key to the Jets is the play of QB Sanchez. As he develops, the team will get better. The Jets will not have the running game they enjoyed last week because of the Vike’s DTs the Williams brothers. The Vikes need it more and win a close game.